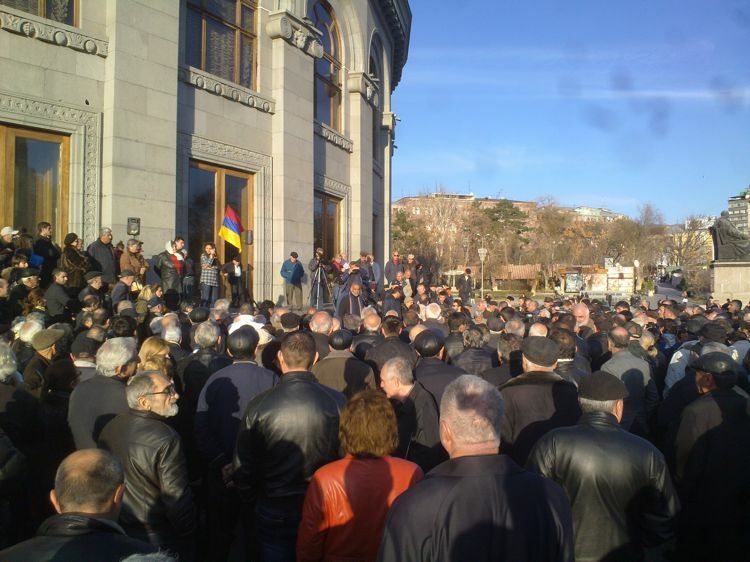 At the last rally held on March 22 Raffi Hovannisian read a list of demands from the president, all admirable but unrealistic since he feels empowered and unstoppable. 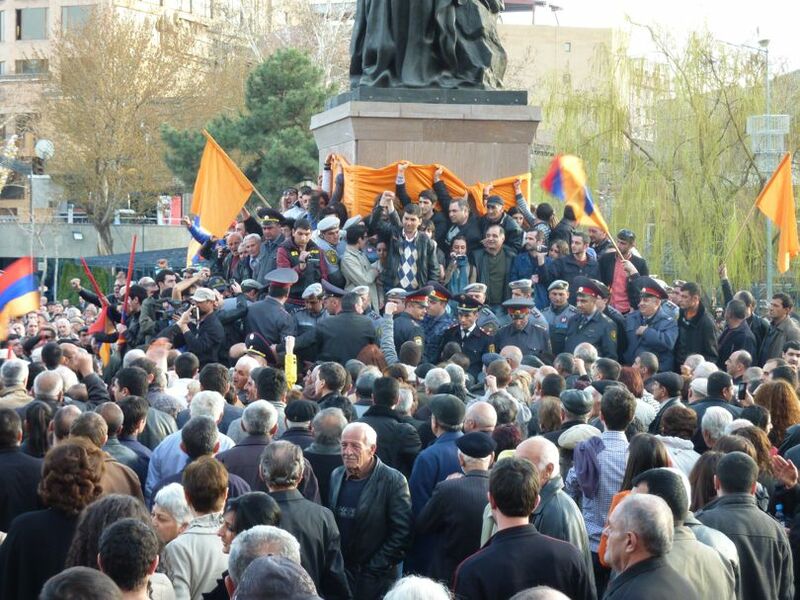 President Sargsyan has already been congratulated by Russia, Europe and the U.S. on his “reelection,” and his arrogance shined last week when he claimed that the movement had only 3,000 supporters by his estimate judging only by the crowds at Liberty Square, apparently ruling out support coming from others around the country and even the world who cannot physically be at the rallies. Essentially Raffi demands new presidential elections to be held, or else he wants to hand pick candidates for several ministries and state offices, not to mention having all those guilty of election fraud arrested, including village mayors and regional governors. In the closing remarks Raffi Hovannisian, nine days into the hunger strike, made the point that the Barevolution has reached all strata of society–in universities, cafés, public squares, homes. In other words, the turnout at the forum should not be a sign that the movement is losing steam. You don’t have to physically be in Liberty Square to support the movement, and in the social media, especially in the comments section of some online newspapers, you read a lot of this negativity, disinformation that people are giving up on Raffi. It’s simply not true. Another BAREVolution rally was held on March 2, this one more effective than the one held just days before. 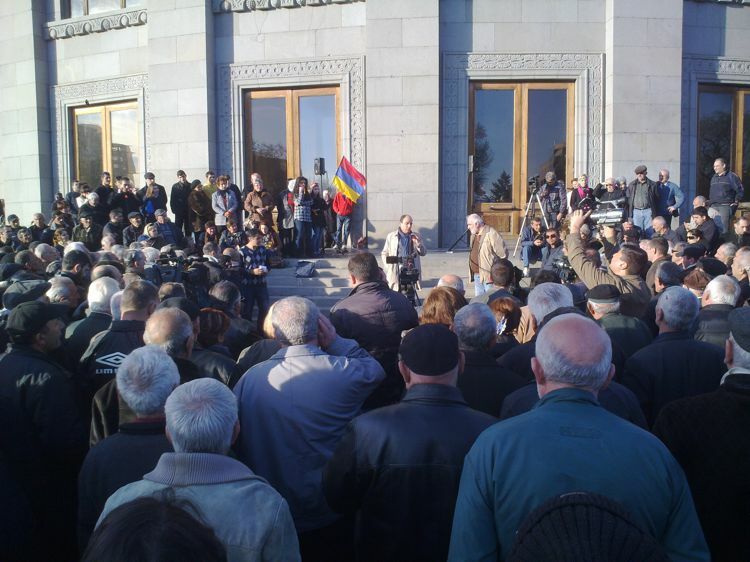 The movement leader and proclaimed president of the Armenian people Raffi Hovanissian spoke twice, and this time his demands were enunciated clearly. He calls on President Serzh Sargsyan and Prime Minister Tigran Sargsyan to attend the next rally on March 5 so they can answer to the Armenian public and defend themselves against claims (which, despite what some Republican lawmakers and supporters have denied publically, have been proven with recorded evidence of fraud by observers and even the official results) that the vote was rigged. He also called for Yerevan Mayor Taron Markarian’s resignation for essentially forcing school teachers to take their students to campaign events for the president. Today he will decide whether he will file a claim with the Constitutional Court to dispute the election, which would likely be a fruitless waste of time and energy. Other notable speakers included Jirayr Sefilian, Andreas Ghoukasyan, Nikol Pashinian and Zaruhi Postanjian. The number of people in attendance was noticeably lower yesterday than previous rallies, which can be attributed to the “police press” shooting everything that moves with their compact video cameras. The collected footage can easily be used to identify people in the crowd and then persecute them in one way or another, for instance by having them fired from their jobs or sending the tax authorities after them (or else simply beaten up). At first I attributed that to dwindling interest before I realized what the real reason was. Many who are able are watching the rallies being streamed live online, too, and that’s obviously happening worldwide judging from the rallies being scheduled elsewhere. I was waiting patiently in the wings to see if I could ask Raffi a couple of questions (I have interviewed him twice for the Armenian Weekly and Hetq Online) regarding whether he was concerned that the movement could potentially lose its momentum, as had been voiced in the social media. But the longer I stood there watching Raffi occasionally thrust his fist into the air and sway to the rhythm of Ruben Hakhverdian and other performers singing songs with messages criticizing the anti-freedom establishment, I became convinced that he’s not worried in the slightest. Raffi is pumped, and he’s using all his energy to channel that vibe of confidence to the Armenian people that change is possible. He wants everyone to comprehend that change comes from within, and it’s up to the people to succeed. He’s been hammering that message home for weeks now. Let’s make no mistake–this is not about a struggle for the throne. It’s about enabling Armenian citizens with power to take control of their own country. It’s about liberating themselves from the tyranny of the Republican-controlled oppressive regime. It’s about being able to express yourself in words or attend public gatherings where oppositional voices are heard, without fear of incrimination or losing their means of livelihood as punishment. It’s about being able to run a small business without the interference of the tax authorities trying to extort bribes rather than obtaining procurements from big business for the state revenue so the government can ensure they hit their artificial GDP targets. It’s about a competitive free market being allowed to thrive. It’s about dissolving growing fascist sentiments within circles of power and finally making democracy work after 21 years of independence from communism. It’s about basking in freedom of self-expression as cultural stereotypes and antagonism break down. It’s about living in a society that is governed by the rule of law, where everyone is equally subject to the constitution without immunity from prosecution. It’s about citizens working together peacefully to build their communities and strengthen civil society without interference from state-sponsored bodies or special interests. It’s about the long-term viability of the Republic of Armenia and the entire Armenian nation worldwide. These are just some of the reasons why the regime must change, that this BAREVolution must succeed. We hope and pray that the transition will be made peacefully. History has shown however that violence hampers movements for change in Armenia, and we must be vigilant of that. But if the pro-government forces and the opposition should come to blows, those fighting for change cannot back down this time around. This struggle for freedom must prevail, and it must do so by April 8. It must not be allowed to fail.